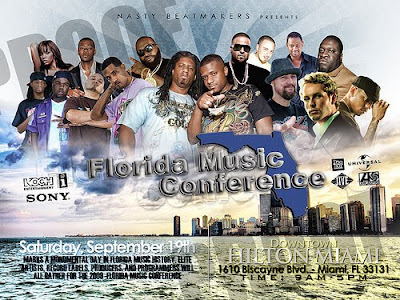 The Maguire: Want To Win Tickets To The Florida Music Conference? I would like the opportunity to have a better understanding of the hip hop hustle. Get advices from people who have done it and see what i need to improve as a person, performer, writter, entertainer, and a leader of the hip hop entertainment industry. Well besides the obvious, I would like to know more ways of getting your music out there other than free mixtapes and internet. Not that those ways are not to be done, but i want more ways so i can get out there and hustle. I would appreciate the opportunity to understand what type risks are taken for a new artist. How are the decision makers dealing with the changing climate of CD, MP3, downloads. Etc. Are the decision makers exposing their artists through tradition marketing avenues, TV, ads, radio and do other media outlets such as webcast, internet radio, dot.coms, etc. prove more of an impact and cost effective. I would like to learn what I don't already know. the information I would like to take with me from the music conference is marketing stradegies for a record to be playable on the radio & how to correctly market an artist to be acceptable for A&Rs & Music executives. As well as what going on in the music industry ??? I would love to take in all of the info given by each of the panel members and also I would love to pick the panel mambers brains on how to last in this ever so competative industry. It's hard to get into the music industry but even harder as to having a solid career and staying a constant force in the game for years to come. I would most likely want to learn how to become a professional Music business woman. By me being a woman trying to enter the music business, I know that there are obstacles that get in the way, there are people who will try to take advantage of you, and there are certain things that we/I have to watch out for.Last but not least I would like to know what a standard music business CONTRACT looks like; In other words, whats considered a good record deal, and whats considered a bad record deal. 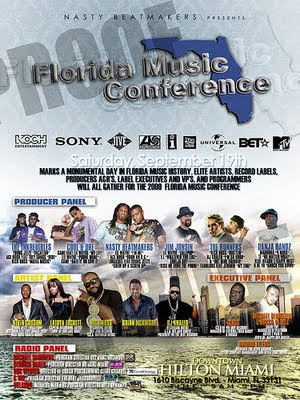 i'd consider myself SUPER lucky to be in the presence of Industry Heavyweights like DJ Khaled, The Runners, Jemaine Dupri.. These people have influenced my life dramatically! The chance to even share a conversation with any of these people would be life changing. From this experience i would take away tips that these Music mogals probably don't want everyone knowing, and implement them with my own skills to make me into the Super Producer i want to be! **I Hope I Win! Thanks for the Chance Jesse! As an Artist I would like to gain knowledge and wisdom on how to conduct myself as a successful and marketable artist. I truly believe that there is a difference between being an artist and being a marketable artist. With the knowledge I intake from the conference, it will enable me and guide me to being a marketable artist. Obtaining advice and information from successful entertainers will put me in the mind set of a successful business man. Thank You. The things that would be most useful to me would be the learning more of the business side of the music industry. As a upcoming artist we think its all about the music and if the music hot then the money will take care of it self but by my experience and oberserving the music industry if you dont have your business together than people would take you for granted. I seen this happen to many artist that I know and I refuse to be one. I really love music and the culture especially hip hop but I and many artists out there would agree this is a "music business" and that one part that some people forget. Thanks you for this opportunity. I am seeking knowledge in all aspects of the industry. As an upcoming local artist & self-made producer I am looking to absorb all the information I can.I am committed, original and willing to work hard towards my goals in my pursuit of a career in the music industry. I would like to attend the conference to network with likeminded people from across the country. The information and contacts would help increase everyone involveds fan base. I'd like to be part of a team to help engineer an independent distribution network to get the word out about the good material out there, and I know ill be able to get it done. I would like to ask industry heads what a unsigned talent should do to break into the industry and still maintain creative control. Also, get any insight and constructive criticism on my own music. I think the best advice I could give anyone I see here posting trying to win is to go listen to Liquid Swords by GZA and that will explain how power is gained and maintained. Then you can learn the technicalities from the conference. Great contest Jessie! You're doing a good thing here. I think this workshop would be a great networking tool and could help me build relations with other producers and artist in the industry. I have been getting placements here and there with a few known artist, but its been hard to reach other artist through the internet. This workshop will give me a chance to meet and connect with these artist/producers on a personal level.